Mini downhill bikes are growing in popularity and rightfully so. 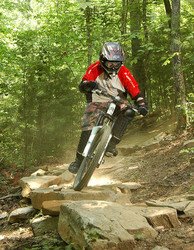 These smaller bikes allow people to use one bike to do both trail riding and light-to-medium downhilling. 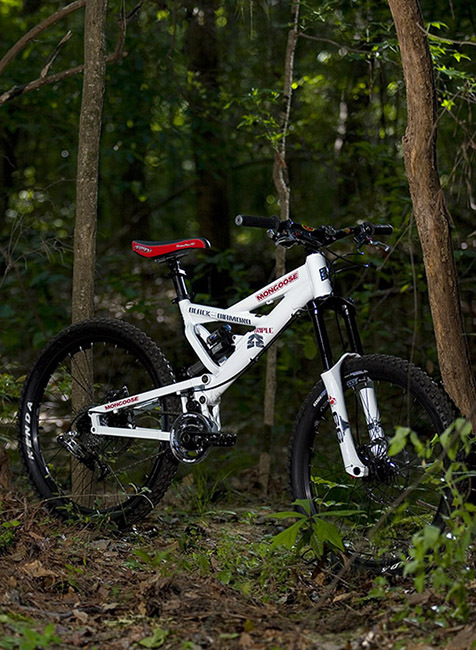 The geometry of these bikes is modeled after their larger downhill counterparts. Some of these bikes are also marketed as freeride bikes and they are also fully capable of filling that niche. They offer a great value to people that may not have big mountains near by and therefore cannot justify investing in a full downhill bike � for these riders mini downhill bikes are the weapon of choice. Over the past two years, Mongoose has been getting their foot back into the door of high end bike market with their introduction of the Freedrive suspension design first seen on the ECD downhill bike. They have outfitted an entire line of suspension bikes with the Freedrive system. The Freedrive system has the wheel path of a single pivot bike because functionally, it is a single pivot bike � a high pivot single pivot design to be exact. 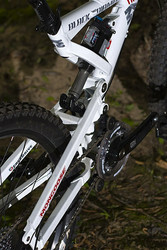 However, the major shortcomings of a high single pivot bike have been overcome with the Freedrive system. If you have ever had the opportunity to ride a bike that is designed with a high single pivot you will remember the feeling of a front end made of lead due to the effective chainstay lengthening when compressed. The Freedrive system overcomes this characteristic of a high pivot by moving the bottom bracket rearward with the suspension movement. This keeps the chainstay lengths constant and there by allows the bike to manual like a typical bike. The frame member that the bottom bracket is part of also actuates the shock. While they were able to overcome the most noticeable fault of the high pivot, the other negative aspect of the high pivot still exists � the lengthening of the wheelbase. 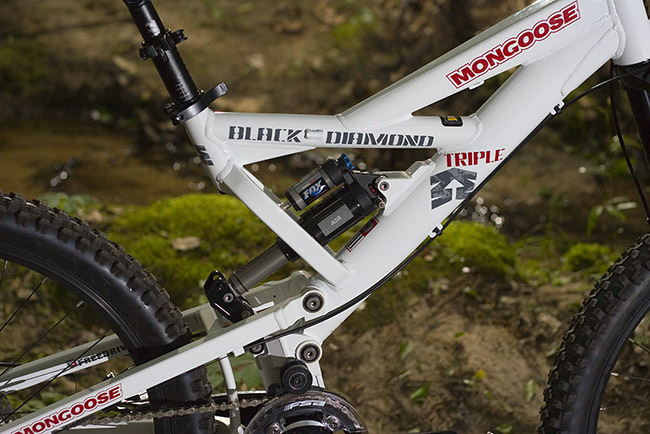 The Mongoose Black Diamond Three (BD3) fills the mini downhill and freeride niche of their lineup. The rear end of the BD3 is identical in structure and design to the rear end of their downhill model, the ECD, and can be adjusted to either 6� or 7.5� of rear wheel travel. The fact that it shares the same rear end as the ECD is good for the BD3, but in my opinion, bad for the ECD. The removable dropouts on the rear allow the bike to come in one of two flavors: standard quick release or RockShox Maxle thru-axle. There exists a small amount of flex in the rear of the frame, but an acceptable level for a small bike. The multiple pivots of the rear suspension must be checked often as they can cause excess movement in the rear suspension and I often found them loose (blue Loctite helped to cure this problem). All pivots of the frame ride on bearings to provide smooth movement. The geometry of the BD3 is great. Mongoose chose a slack 66 degree head angle which is perfect for this bike. 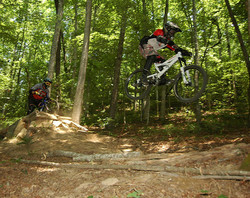 One thing that has turned me off from other bikes that are labeled as freeride or long travel all mountain bikes is the use of some overly steep head angles. 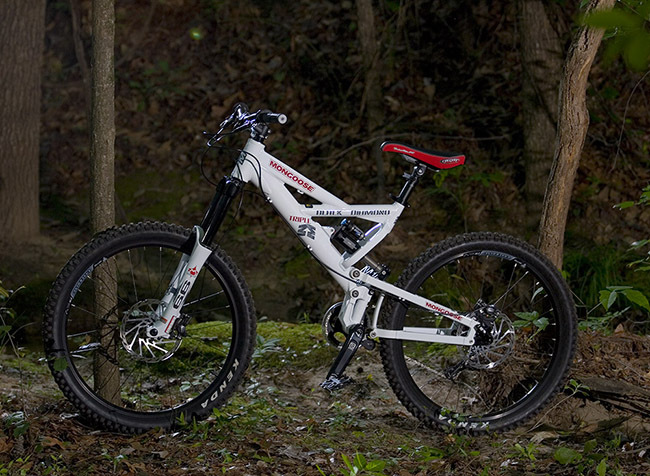 The slack head angle of the BD3 makes it perform great as a mini downhill bike. Other aspects of the geometry were very neutral and made riding the bike a piece of cake. The bottom bracket is a little on the high side but necessary for a bike that has up to 7.5� of rear wheel travel and equipped with 175mm cranks. The BD3 truly shines is the performance vs. cost department. The bike is speced with some very good components. A Fox DHX Air 4.0 is on duty for the rear suspension and a Marzoochi 66 SL provides the squish in the front. The BD3 uses a Easton handlebar and stem (EA70). Avid Juicy 7's provide the stopping power for the bike. The bike is equipped with a single ring chainguide from FSA and an FSA Gravity crankset (175mm). Drivetrain duties are supported by SRAM X9 shifters and rear d�railleur. Seating accommodations are from SDG - an I-beam saddle held on by a telescoping seatpost. For rolling stock, the BD3 has a set of WTB FR Speeddisc wheels that come wrapped in Kenda rubber. Even with this gracious list of components, the BD3 is still priced at only $2999 MSRP. During our time riding and testing the bike we were very pleased with all the components that came stock on the BD3, with the exception of the wheelset. Of all the components on the bike, the only piece we felt warranted changing was the wheelset. The WTB rims were some of the worst rims I had ever mounted a tire to. Once mounted, it was very difficult and sometimes impossible to get a proper setting of the tire bead. Not only was tire mounting an issue, I consistently had flats due to snakebites on the tubes. The Marzocchi 66 SL can be intimidating to adjust due to the amount of adjustments you must perform. However; through some online research and a little trial and error, the 66 SL performs very well and offers a very smooth ride. The telescoping seatpost was at first thought to be unnecessary but in the end, turned out to be very useful for trail riding. Out of the box, the BD3 tipped the scales at 39.6lbs, a little on the heavy side. Putting 2-ply DH tires on the BD3 put it over the 40lb mark. The testing of the bike lasted for 8 months, during which time I used the BD3 over every type of terrain that I ride. I used the BD3 for trail riding, freeriding, and racing DH. I learned that the BD3 is a very versatile bike. At first, I restricted using the bike to only DH trails. Later I began to use it for trail riding as well. Pedaling the BD3 was much easier than anticipated for a bike with this amount of travel and weight. Trail riding was quite enjoyable if approached with the understanding that you could not put in the miles that you typically do with a light trail bike. 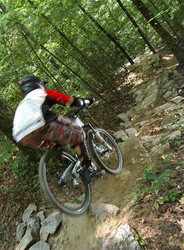 But the ability to completely ride all the trails I usually do with my lighter trail bike impressed me. 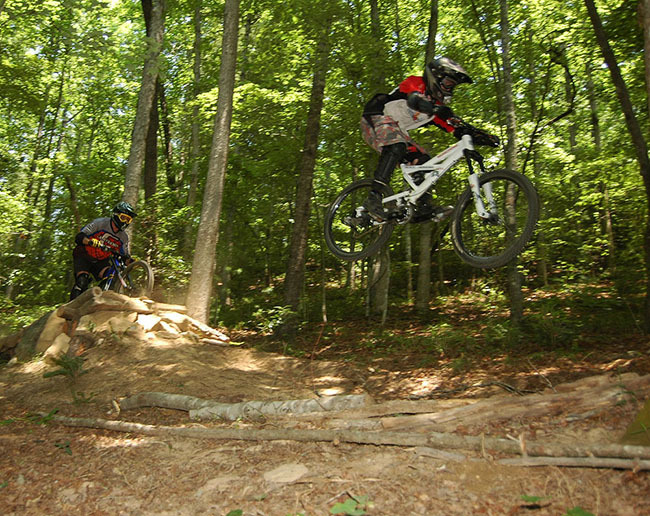 Extended trail rides offered a good opportunity to explore the handling and pedaling characteristics of the bike. The pedaling efficiency of the Freedrive system was very apparent � suspension bob was minimal and making adjustments to the Pro-Pedal from the Fox DHX air completely eliminated undue suspension movement while mashing on the pedals. While not too important on a bike of this type, there were no adverse effects on the movement of the suspension due to chain tension. Ride quality of the rear suspension is top notch as expected from a high pivot. High pivot bikes make for great straight line performance. The rearward path of the wheel allows it to smoothly absorb big hits. 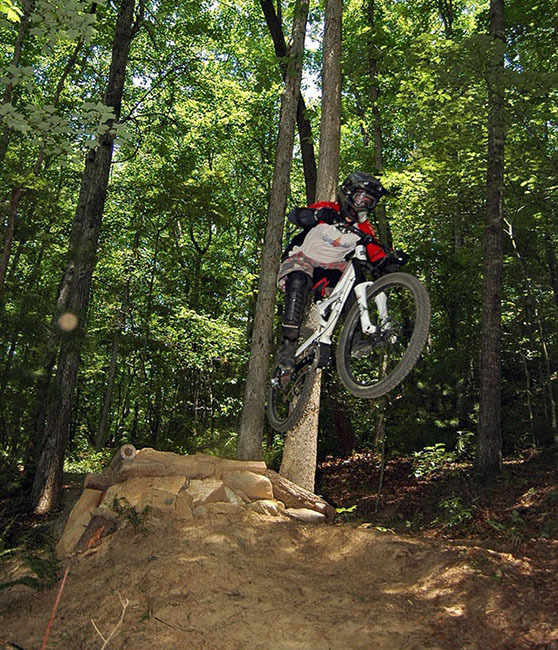 The DHX is an ultra smooth shock and the air adjustments make it very versatile � a good match for the bike. The 66 SL makes for a perfect match for this bike. 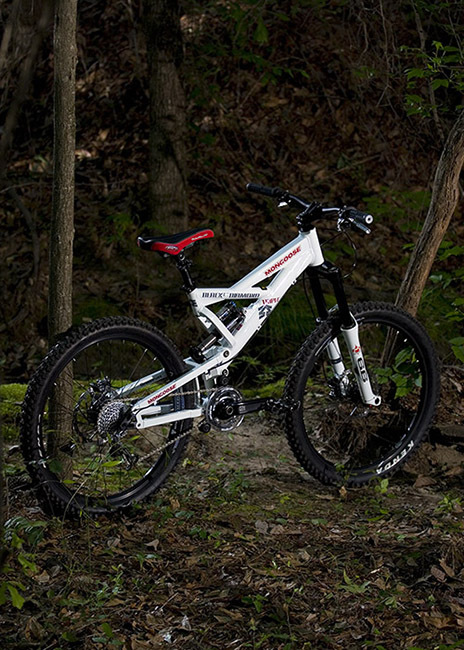 The 66 SL has buttery smooth suspension movement that you come to expect from Marzocchi. As noted before, the wheelbase of the bike lengthens as the bike goes through its travel. That has a noticeable affect on the handling of the bike. The BD3 is prone to under steering in corners, a trait that comes from the wheel base stretching when you compress into a turn. 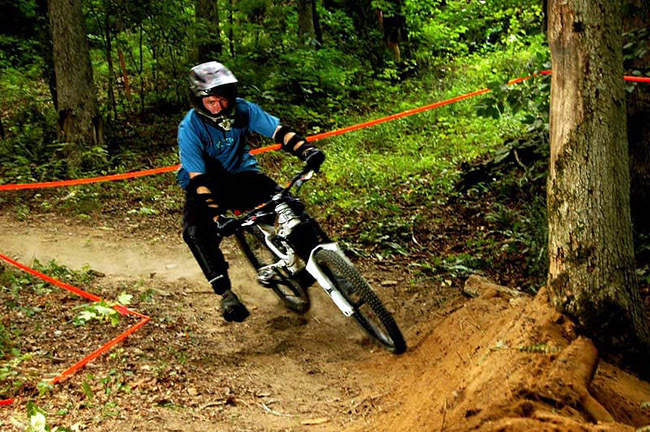 It can be counteracted to some degree by adjusting your position on the bike through turns and getting your weight farther back to pull the front end around the turn. Turning prowess was the worst aspect of the BD3. Being a single pivot does mean there is some brake jack to the design. The only time brake jack was ever noticed was during landings when I had the brakes on as I landed. While braking for turns and general trail braking, there never was any noticeable brake jack. Eight months of consistent riding gave me enough time to see how well the BD3 would hold up to extended ownership. Overall, the BD3 was a very easy bike to maintain and not many things went wrong with the bike. The hardware loosening issues mentioned before are easily eliminated by a dab of blue Loctite. However, without Loctite you will constantly get play in the rear suspension due to loose hardware. Tire changing was never a task I looked forward to because of the rims and I also found out that the WTB hubs offer some other unwelcome surprises. There is nothing that securely holds the cassette to the hub and it can come off if you are banging the wheel around with it out of the frame. With the tires being so difficult to mount and set on the bead, a lot of banging is required to get tires on and off. I quickly learned to either secure the cassette into the wheel with a zip tie or grab the cassette and pull it out of the hub before it went flying across my floor. Value is where the Mongoose BD3 shines above all other bikes in its class. The BD3 has one of the best spec of components of any small freeride/mini downhill bike for the price range. There aren�t many other bikes on the market that have the BD3�s level of components and a sub $3000 price tag. While there are minor issues with the bike and some may say that the bike is heavy for its size, to get a bike that performs this well with top shelf parts, you�d have to spend close to $5000 for a boutique bike. Posted on Apr 17, 2008 11:44:58 -0400 by Brady.